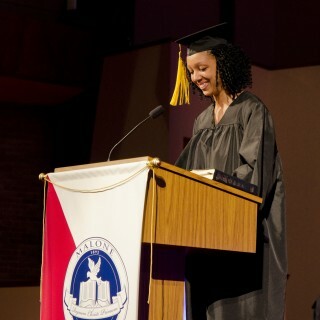 Faith integration is a way of life at Malone. We recognize that students arrive on campus with different ideas about God. Whether you are just beginning to ask questions about faith or are a long-time follower of Jesus Christ, we want to meet you where you are in your journey. We believe that faith and knowledge are COMPLETELY bound to one another, not to be SEPARATED or fragmented. In class, faculty challenge students to examine what Christianity has to say about a given discipline and what that discipline has to say about the Christian faith. We believe that Christ is known not only through Scripture, but also through the pursuit of knowledge. We are called to make Christ known through scholarship in our individual disciplines, evangelism to our community, and service to others. These actions reflect our conviction that a Malone education should equip students to fulfill their callings, so we create an environment to nurture intellectual curiosity, creativity, critical thinking, compassion, and spiritual growth. The Malone community is dedicated to helping you deepen your faith and strengthen your ability walk with Christ as you enter the professional world. You'll meet students who share your passion, and faculty who are here because they care deeply about being active people of faith. With an emphasis on mentoring, discipleship and personal growth, we aim to be one of the most enriching, nurturing places to which you’ll ever belong. What is distinctive about a Malone University education? Associate Professor of Biblical Studies, T.C. Ham, weighs in. There is more than one way to meet with God. In fact, there are more than 300 opportunities each semester!